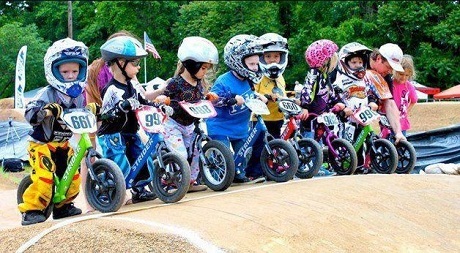 Following the successful trial and demonstration of the balance bike concept at the 2012 BMX National Championships, BMX Australia is excited to open a new category of participation to children as young as 2 years old within the sport of BMX. 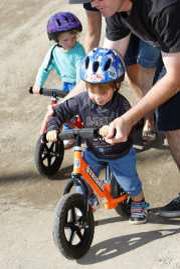 Known as “BMX Mini Wheelers”, participants will be able to ride what is commonly known as balance bikes – bikes with no pedals. BMX Mini Wheelers is an introductory level where riders develop balance, gross motor skills and independence to begin riding a bike. Riders will be able to develop skills that allows their progression in the sport to become seamless as they progress on to the more traditional BMX bike at 5 years of age. BMX Mini Wheelers becomes the new entry point into the sport for riders too young or not competent in progressing to the Sprocket program. After participating as a BMX Mini Wheeler riders would have become familiar with the BMX track and be on their way in developing their skills so that the transition to Sprockets is much easier. Pit bikes can be used, but must have cranks removed and not exceed 35 inches 88.9cm.